November 7th is National Bittersweet Chocolate With Almonds Day (National Almond Day is February 16th, National Chocolate Day is October 28th, National Milk Chocolate Day is July 28, National White Chocolate Day is September 22). Chocolate bundt cake with chopped almonds. Layer cake with chocolate frosting and almonds on the sides and/or top. Flourless chocolate cake made with almond flour or finely-ground almonds. 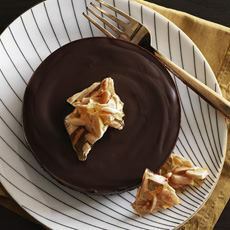 Torte with an almond ganache filling. Chocolate almond bark. Add pumpkin seeds for the season. Chocolate almond clusters. Add some dried cherries or cranberries. Chocolate almond fudge. You can add almonds to chocolate fudge or make a chocolate-peanut butter fudge recipe with almond butter. Chocolate chip cookies with almonds instead of pecans or walnuts. 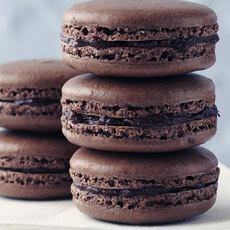 Chocolate macarons (French macarons are made with almond flour). Chocolate cookies with chopped almonds, or with a whole almond pressed into the top when the cookies come out of the oven. Meringues with mini-chocolate chips and finely chopped almonds (use this recipe as a guide). 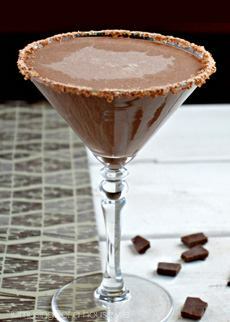 Chocolate almond cocktail (recipe below). Chocolate almond milk (Almond Breeze, Pacific, Silk, etc.). Hot chocolate, chocolate shake, smoothie, etc. made with almond milk. Chocolate cream pie or chocolate silk pie garnished with almonds. Chocolate tart with almond crust (substitute almonds for the pumpkin seeds in this recipe). Chocolate bread pudding with whipped cream and almonds. Hot fudge sundae garnished with almonds. The original concept, assembled by THE NIBBLE in 2005, has been widely copied. Check out all the American food holidays. We serve this cocktail for dessert. Nothing extra is needed, but a few Amaretti di Saronno are a welcome addition. 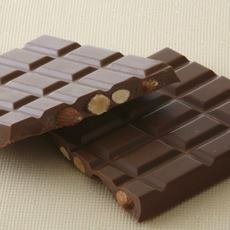 A chocolate bar with almonds (photo courtesy Royce USA). Here’s the recipe from Giada De Laurentiis (photo courtesy Delish). French macarons are made with almond flour; thus, chocolate and almond (here’s the recipe from FoodToLove.com.au). A chocolate cocktail with an almond cookie rim (photo courtesy Musings Of A Housewife). 1. FINELY CRUSH the cookies and place them on a plate or in a shallow bowl. Moisten the rims of the glasses and twist in the cookie crumbs to coat. Set aside. 2. COMBINE all ingredients in a cocktail shaker with the ice. Shake and strain into a Martini glass.